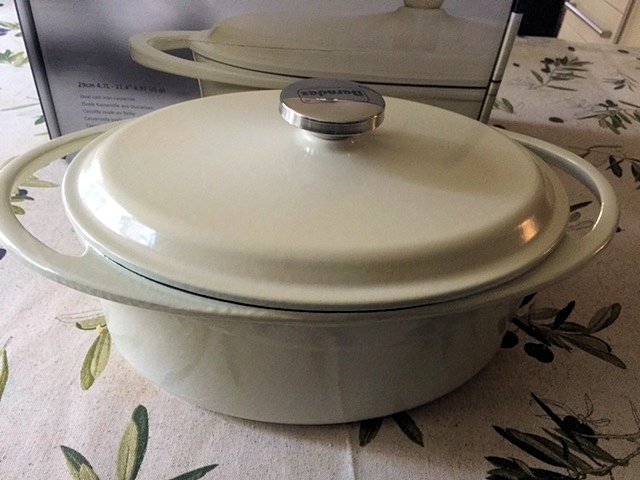 We gratefully received a Tesco Berndes Cookware cast iron casserole dish, from the Tesco Kitchen range, with the challenge of creating a meal in one pot. I’m familiar with one pot cooking by using my slow cooker, but cooking a meal in the oven as a casserole hasn’t been a common occurrence for me. The only casserole dish I owned, was not quite able to hold a full meal for six people, so my new dish was perfect for the job. I really like the large handles at either side of the pot, as they make the dish easy to remove from the oven. I could fit my hands with oven gloves on around the handle. Don’t forget to put an oven glove back on to lift it again though. Four of my fingers suffered when I made that rookie home cook mistake. The Berndes Casserole dish has received 5 out of 5 in a recent review on independent.ie, beating some big name rivals! Read the review here. There are three sizes, the 20cm, 24cm and the biggest, which is 29cms. Tesco are running a sticker promotion between 29th September – 25th January 2015 where you can save up to 70% on exclusive Berndes cookware products at Tesco. For every £20 you spend online OR in-store you can collect a sticker, once you’ve collected five stickers you can use these to save up to 70% off professional kitchenware items. 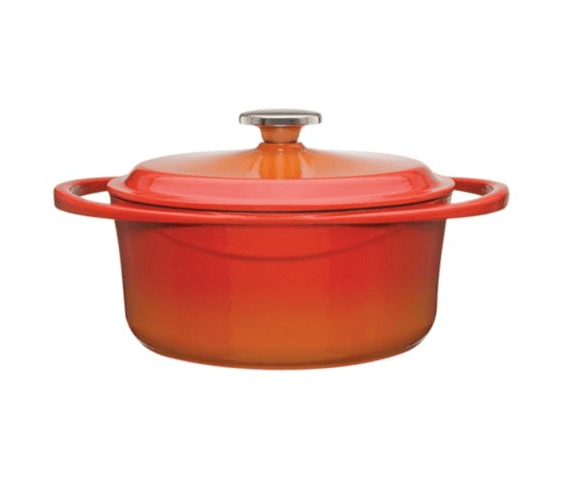 The Berndes range of casserole dishes starts at £119, up to £134.99. You can save up to 70% off the Berndes cookware range with 10 stickers at Tesco, find out more at bit.ly/1uwNo3f You can use your stickers up to Sunday, the 11th of January 2015. I’m also giving one of these fabulous dishes away. For the giveaway, the colourful 24cm dish is the prize, and it’s a lovely one, worth £120. Keep an eye out on the blog, as it will be live later today. To create a meal in a pot and share the recipe with them. Set the oven to 220 Degrees C.
Add the olive oil to a shallow frying pan, then sear the chicken to seal the meat. Add the onions and carrots towards the end to lightly fry those. Add the chicken and vegetables to the casserole dish. Top with the chicken casserole mix and stock pot. Fill the dish to almost three quarters of the level of contents, stir, then cover the dish with a lid, or tin foil. Reduce the heat of the oven to 180 Degree C and cook for up to 2 hours, or the chicken and vegetables are fully cooked. If you prefer a thicker gravy, remove the casserole from the dish about ten to twenty minutes before the end of cooking. Mix cornflour with a little water until it is fully dissolved. Add it to the dish and fold into the casserole. Put the casserole back in the oven until the gravy has thickened. I’d seen these in store and wondered what the promotion was. For the first time this week I was actually offered the stickers at the checkout! I shop there all the time and they’ve never mentioned it before and I’ve never had stickers with my home deliveries from them either. I really want one of the larger ones so now I know I’ll be asking for the stickers. Hopefully I’ll have enough time to collect them before the promotion ends. I’ll definitely be entering your giveaway.